Boating in Varanasi or taking boat rides in the holy city is one practical way for travelers to take in the panoramic view of the west bank of the Ganges River. Boating has also become a popular pastime not just with visitors but also with locals. It is also considered to be the highlight of any Varanasi trip that can ultimately show what the city really has to offer. With ghats and temples that dot the riverbanks of the sacred river, boat rides are the most popular way to get around, especially during sunrise and sunset. 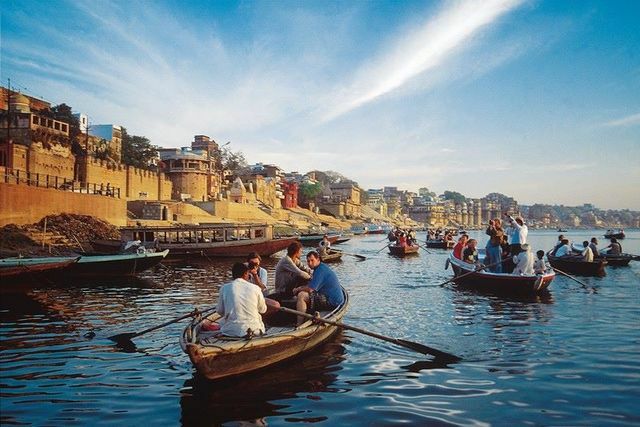 Varanasi cruises or boat rides allow a traveler an unimpeded view of the colorful sights of pilgrim bathers taking a dip onto the sacred waters of the Ganges River. There are almost one hundred ghats that lead to numerous temples and other houses of worship in the surrounding vicinity. Unlike some boat operators in other places, travelers are allowed to do a spot of rowing for a complete boating experience. Boats are rented by the hour as the seating capacity varies from boat to boat. Most of time, boats can only seat four while others more than that. Fare prices also vary depending on the size of the boat and the location of where the boat was hired. Bargaining for fares are the way to go even if only one person is riding the boat. Tourist rates tend to be higher than local rates, so it will be best to ask around first before hiring a boat so travelers would not get ripped-off. Regulations regarding fares were long set since 1998 as a large sign in Dasashwamedh, written in Hindi, advises everyone about it. The signs displays the price limit to boat rides since some boatmen will bargain up to 300 rupees to foreign tourists. For spontaneous boating trips, sunrise and sunset boat rides are the best. Sunset trips are quite magical right after the Aarti, the Worship of Fire, in Dasashwamedh Ghat, one of the busiest and most entertaining ghats in the vicinity. Boat trip routes usually start at the Dasashwamedh Ghat, where most ritualistic ceremonies are held every evening like the Aarti. Travelers will then get to see the festivities in its entire unrivaled glory. Sanskrit chanting by priests with the accompanying sounds of drums and cymbals then serenade travelers navigating the vast Ganges River. Soon enough, the boat will progress through other ghats like the Manikarnika Ghat, which is known as the largest cremation site and other notable scenic spots along the holy river. Dawn boat rides are also magnificent. This particular time is when pilgrims converge in the different ghats in close proximity to the many temples and holy places, where they take the ritualistic bathing to cleanse themselves before worshipping. The colorful array of women’s saris are often compared to a kaleidoscope of candy-hued spectacle that is commonly captured on camera by famous photographers. The best times to go boating in Varanasi are from October until March since the weather is not too hot. However, December and January weather tends to be cooler making boating an even more scenic experience. Booking options for a Varanasi cruise can be for a one day trip or a multi-day trip. Advance booking is recommended for convenience as reservations are available online or though travel and tour agencies.